At this point in this marathon training cycle, I’ve covered just over 308 miles, with almost 80 of them just this month (still with a week remaining in June). The target is set to qualify for the Boston Marathon with a time of 3:14:59 or faster in the Salmon Marathon (ID) on September 8th. Had I not jacked-up my knee back in March, I’m sure the mileage would look very different, but it’s good to see it coming back up. In fact, even with a week to go, June is already my highest-mileage month in 2012. I’m sure July will top it, if all goes right. My speed is also improving, with my first-ever sub-2 half-marathon on Sunday (during a 14.3mi training run). So, all things considered, I’m feeling slightly optimistic for the Salmon Marathon. I know I’ve got to be cautiously optimistic though. There’s a lot of work still ahead in order to cut 71-minutes from my marathon PR set back in 2008. So, with 300+ miles on my shoes, it’s getting to be time to consider replacements. 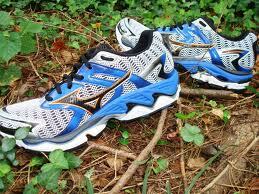 I’ve been running in the Mizuno Wave Nirvana 8, and haven’t had any problems with them at all. However, I wonder if I can do better with something lighter and more minimal? These Mizuno’s are pretty hefty and substantial, probably more so than need be, and they really haven’t held up very well with a lot of trail miles. A lot of things I’ve read recommend replacing your shoes every 300-500 miles, depending on type of use, conditions, durability of the shoe, runner characteristics, etc. So, I’m officially into that window…and I’m also noticing some wear and tear on my shoes, including fabric tears deveoping on the front-outside edges of each shoe. Anyone have recommendations out there? What running shoes do you like, and why? It’s nice to see the pace of the blog picking up. I recently switched from my Brooks to the Saucony Kinvara, and I gotta say, I love the shoe. I don’t know if it’s the light weight or the minimal 4mm rise, but it seems to have changed my stride a bit. What’s really interesting is that I convinced Suzanne to try a minimal shoe as well (she went to the Brooks Pure Cadence), and we both noticed an instant change in her gait as well. It seems like all of that energy that was getting absorbed by the heel/leg is now transferring a little better with some forward spring. Both of us feel like we’re running faster in these shoes. Suzanne has done some 6-8 milers and hasn’t had any complaints about comfort over those distances, but I’m not sure if a minimal shoe might take a different toll at higher distances. Call me wind because I am abtosulely blown away.